The Resort at Paws Up outside of Missoula, Montana, has offered discounted rates on Jetsetter.com. (CNN) -- Frederick Shilmover was surfing the web for the perfect vacation when he made the impulsive decision to buy a trip out West on luxury deal site Jetsetter.com. "It was pretty amazing," said Shilmover, a recent Harvard business school graduate. 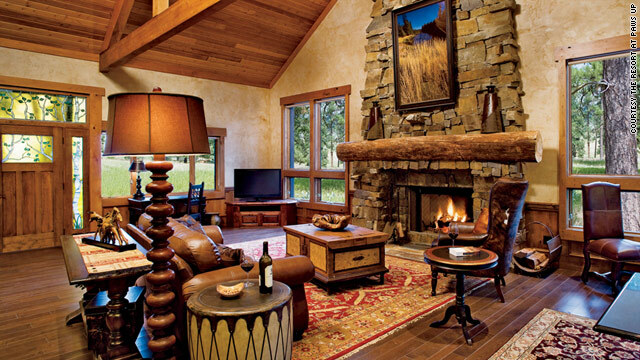 "We ended up paying $390 a night for a 3,000-square-foot house with a hot tub, big kitchen, like 10 flat screens, fireplace, porches ..."
Shilmover, his wife and a friend spent three nights at the Resort at Paws Up outside of Missoula, Montana, in May. "The resort picked us up from the airport and told us that, what's his name, Mick Jagger from the Rolling Stones, was there before," he said. "We felt like we were in a place that we didn't necessarily deserve to be. But it was great." In-the-know travelers are likely to find more great deals on websites such as Jetsetter, Luxury Link and Tablet Hotels. These and other specialty sites offer high-class getaways at prices that make it easier to travel in style without designer costs. The weak economy has played into creating more savings opportunities for customers. "We have 25 percent more hotels participating on our site than we did a year ago, and that's a direct reflection of the economy," said Diane McDavitt, president of Luxury Link. Hotels in the luxury segment have "been hit a little harder than the other segments, and their occupancy is not what they want it to be. So they're looking for creative ways to reach their consumer. Like our site. It's a little bit of a perfect storm," McDavitt said. But how are these websites able to provide prices they say most travel sites can't? For some, exclusivity is key. "One of the main reasons we are able to offer such low rates on our private sales is because it is actually private; the rates aren't public for anyone to see on the Internet," said Lindsey Smolan, marketing specialist for Tablet Hotels, an online travel agency and booking site that features luxury hotels. Jetsetter founder and CEO Drew Patterson attributes his site's success to much the same thing. "It's an invitation-only community," he said. "Our sales only last for just a couple of days, and we have limited amounts of inventory. All those factors mean that hotels are comfortable giving us certain prices." To become a member on Jetsetter, you must either be invited by another member or submit your name to be placed on a waiting list. Once you are a member, you'll receive weekly e-mails describing upcoming sales, which are then posted for five to seven days. It's these attributes that attract luxury properties. "Jetsetters is a private, short-term sale, which makes it appealing for luxury hotels. The rates are exclusive to Jetsetter members only and not available to the general public," said Paul Sposare, director of sales and marketing at Bardessono, a luxury hotel in Napa Valley. Other sites, such as Luxury Link, don't require buyers to be invited members. "We've worked with many of these hotels for all of our 13 years. We work with them to create a special package." McDavitt said. "The hotel is doing it because they're interested in exposing their property to a specific audience, and the effect of that is that we've got all these terrific opportunities available to the consumer." Much of Luxury Link's inventory consists of package deals. A buy-now package could include three nights in a luxury suite in Hawaii for two -- with gourmet breakfast daily, one three-course dinner for two and wine with appetizers every evening for just under $1,000 total. Or it might be four nights for two at the Carlton in New York for $1,500. Luxury Link sells vacations two ways: through auction or immediate purchase for travelers with less flexibility. "On average with our auctions, a consumer can save 50 percent off the regular rate, but sometimes they can be saving 65 percent," McDavitt said. Many resorts have had difficulty filling rooms during off-season, said John Romfo, director of sales and marketing at Paws Up. "When I say the economy has affected us," he said, "it really, really affected our shoulder season, so that's when we had to decide to reach out." Romfo said that travel agencies know their clients aren't interested in buying shoulder season rooms, so hotels must look for additional outlets for marketing. In most cases, resorts don't want their low prices advertised all over the Internet, so they turn to sites that require member access or hide their prices in a package deal. "They look at Jetsetter in a way that's different than how they look at, say, Expedia," Patterson said. And so maybe should the average traveler. Consider the Gansevoort South, a block-long resort by the ocean in Miami's South Beach with a roof-top pool and notoriously expensive dining. On Jetsetter, the Deluxe City View room, which houses four, costs $135 a night. A recent search for the same property and dates on Expedia and Hotels.com yielded a rate of $215. Looking for something even more exotic? How about the Desert Islands Resort & Spa by Anantara, located on an island five miles of the coast of Abu Dhabi, UAE. Based on a recent search, it'll cost you $354 without taxes for the Deluxe Seaview Room on both Expedia and Hotels.com. On Tablet you could purchase one night in the Deluxe Suite for $205. So perhaps it is a good time to take that vacation of your dreams.